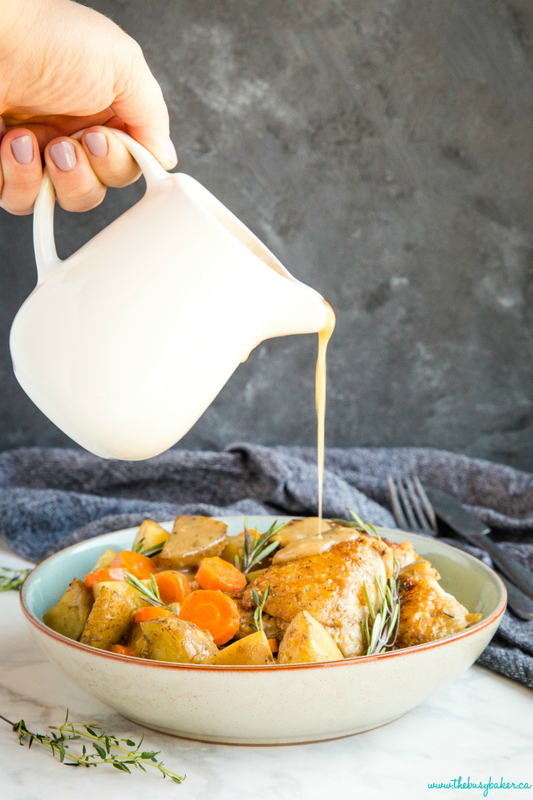 This Easy One Pot Roasted Chicken Dinner recipe is SO easy to make, and it’s the perfect family meal with all the fixings and gravy, made in only one pan! I don’t know about you, but fall is my favourite time of year for cooking. I just love labouring over a delicious homemade comfort food meal for my family to enjoy, cutting vegetables by hand and making sauces from scratch with the perfect balance of spices. Of course, I have a passion for cooking and it’s one of my favourite things to do. It’s cathartic for me, and it’s something that’s good for the soul and allows me to express my creativity. 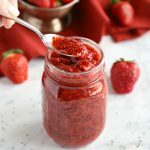 Naturally, I know not everyone agrees – some of you love cooking as much as I do but others of you probably just want to get in and out of the kitchen as quickly as possible. 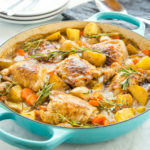 This Easy One Pot Roasted Chicken Dinner is the perfect marriage of both those worlds; it’s got all the flavours of a roasted chicken dinner cooked low and slow on a Sunday afternoon, but it’s on the table in about an hour with only one dish to wash. Now what could be better than that!?? The key to this dish is flavour, specifically herbs and white wine. Using fresh herbs is great, but if all you’ve got is dried thyme and rosemary those will work just fine. 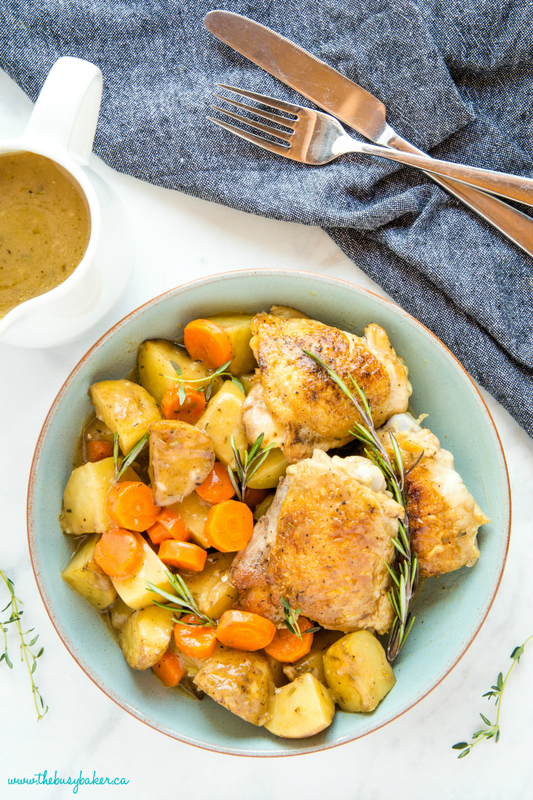 And a nice dry white wine creates such a delicious sauce – you’ve GOT to try it! Use bone-in and skin-on chicken. Leaving the bones in and the skin on will help the chicken cook evenly and not dry out. Season generously. Seasoning your chicken makes ALL the difference! Use a good quality sea salt and cracked black pepper. Brown the chicken first. Browning your chicken pieces before roasting helps create SO much flavour both in the chicken and the sauce. Don’t skip this step! Cook the chicken and vegetables in the sauce. What better way to infuse your vegetables with flavour than to cook them fully in the gravy?? 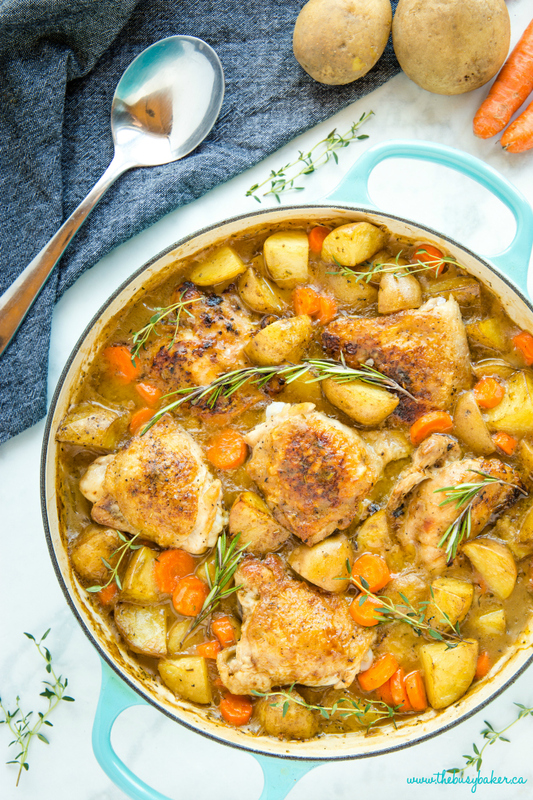 I hope you enjoy this Easy One Pot Roasted Chicken Dinner as much as we do! 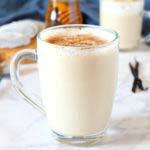 Let me know in the comments below, what’s your favourite comfort food meal for fall and winter? I’d love to know!! 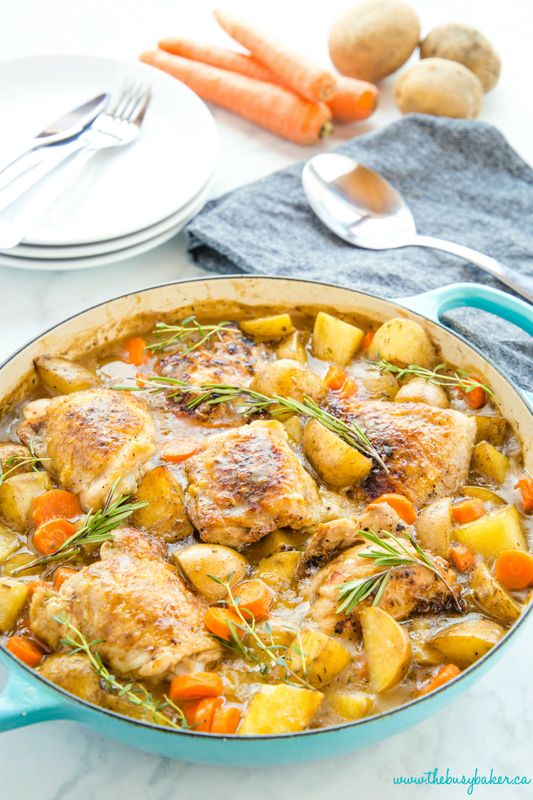 This Easy One Pot Roasted Chicken Dinner recipe is SO easy to make, and it's the perfect family meal with all the fixings and gravy, made in only one pan! Heat a very large oven-safe pan over medium-high heat on the stove top and add the olive oil. Brown the chicken pieces in the pan on all sides, until the outside has reached a nice golden brown. Remove the chicken pieces from the pan and set them aside on a plate. 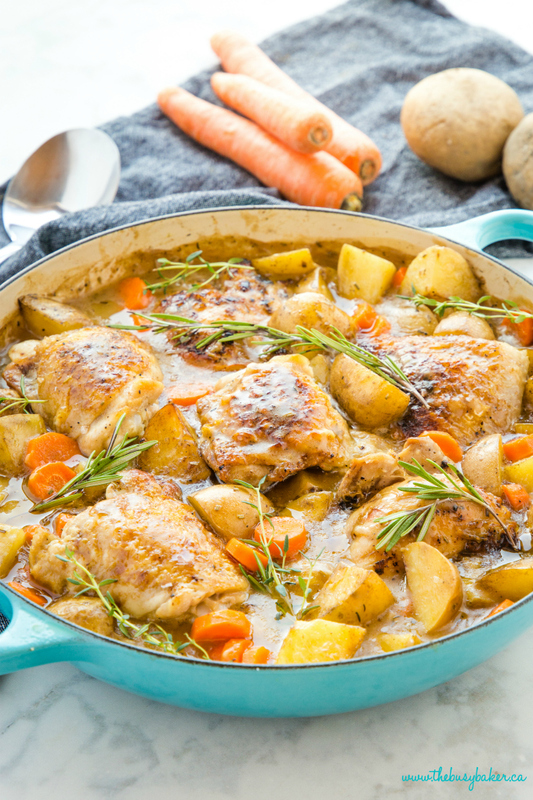 Add the potatoes and carrots to the pan with the chicken liquid and allow the vegetables to brown slightly in the liquid on all sides for about 5-7 minutes. Remove the vegetables to a plate and set aside once they've caramelized slightly. Turn the heat to medium. Add the flour to the liquid left in the pan and whisk until the flour is absorbed. Whisk in the thyme, rosemary and salt and pepper and continue to toast the flour for about one more minute, whisking constantly. Slowly add the wine and whisk as you add it to prevent lumps. Add the chicken stock slowly, whisking as you add it to break up any lumps that form. Let the sauce bubble away, whisking gently as it cooks for about 4 minutes. Add the potatoes and carrots back into the pan, nestling them into the sauce until they're submerged. Add the chicken pieces into the sauce as well, nestling them into the sauce and vegetables. 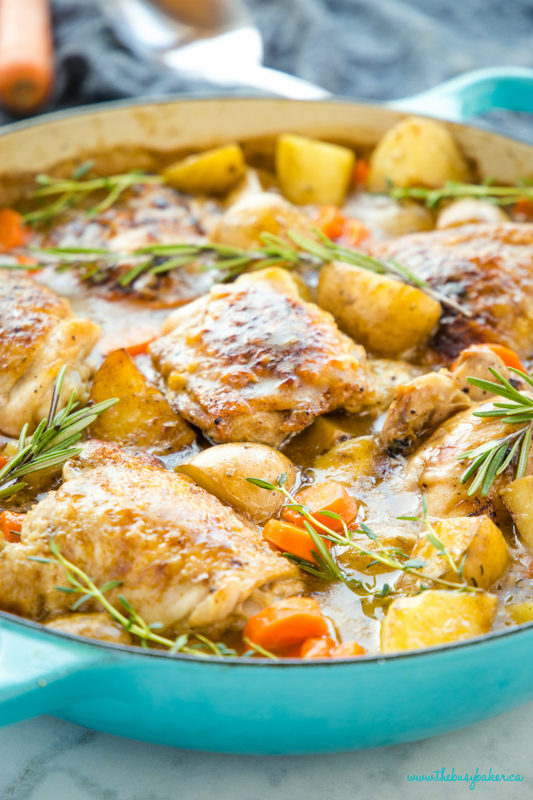 Cover the pan with the lid and roast for about 35-40 minutes at 325 degrees Fahrenheit or until the chicken is cooked through to an internal temperature of 165 degrees Fahrenheit (74 Celsius) and the potatoes are tender. 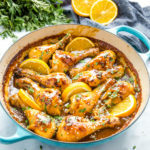 Remove the pan from the oven when the chicken is cooked through and allow it to rest, covered, for about 5 minutes before serving. 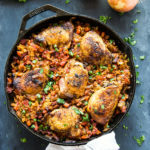 I love one pan meals they are so easy, and this one looks so delicious! That looks like a pan full of comfort and goodness! This looks flavorful and amazing! It sure is! Pure comfort food! 🙂 Thanks! 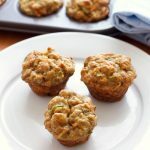 Love a delicious simple dish! I have to make this durning a busy weeknight! This is making me hungry! Looks so inviting! 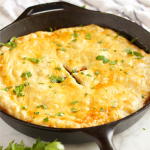 The perfect weeknight dinner! 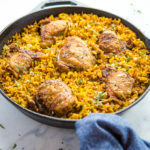 This looks really good for dinner any night of the week! 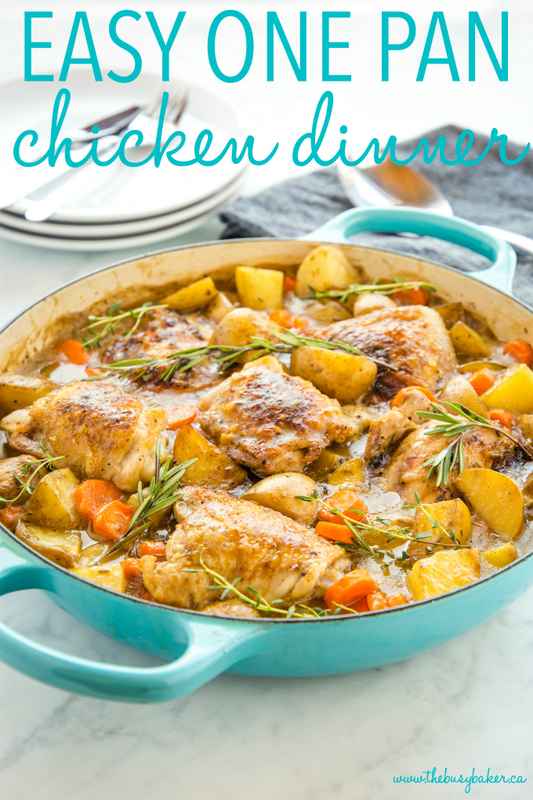 The perfect weeknight dinner!! I love one pot meals!! This looks incredibly delicious! You sure can’t! Thanks so much! Is a 3 1/2 QT. pan big enough for the one pot chicken?